Cmdr. 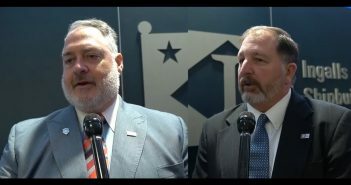 Steve Sloan, USN Ret., Huntington Ingalls Industries’ LPD program manager, and George Nungesser, the company’s DDG-51 Flight III program manager, discuss the latest developments on their US Navy programs with Defense & Aerospace Report Editor Vago Muradian at the Surface Navy Association’s 2019 conference and tradeshow in Northern Virginia. We are an SNA media partner and our coverage was sponsored by Huntington Ingalls Industries, GE Marine, L3 Technologies and Leonardo DRS. 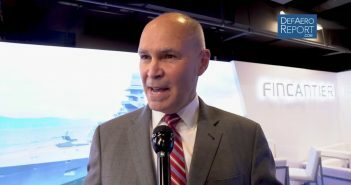 Joe DePietro, vice president of Lockheed Martin Small Combatants and Ship Systems, discusses the variant of the company’s Freedom-class Littoral Combat Ship — with Fincantieri Marinette Marine — being proposed for the US Navy’s FFG(X) frigate program with Defense & Aerospace Report Editor Vago Muradian at the Surface Navy Association’s 2019 conference and tradeshow in Northern Virginia. We are an SNA media partner and our coverage was sponsored by Huntington Ingalls Industries, GE Marine, L3 Technologies and Leonardo DRS. Vice Adm. Rick Hunt, USN Ret., former commander of US Naval Surface Forces who is now chief strategy officer of Fincantieri Marinette Marine, discusses the US Navy’s FFG(X) Frigate program and the solution the company has based its FREMM warship developed for the Italian Navy with Defense & Aerospace Report Editor Vago Muradian at the Surface Navy Association’s 2019 conference and tradeshow in Northern Virginia. We are an SNA media partner and our coverage is sponsored by Huntington Ingalls Industries, GE Marine, L3 Technologies and Leonardo DRS. 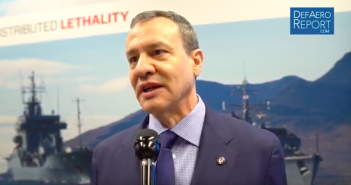 Erik Smith, the president and CEO of Saab Defense and Security USA, discusses the company’s naval portfolio, radars, undersea systems and more with Defense & Aerospace Report Editor Vago Muradian at the Surface Navy Association’s 2019 conference and tradeshow in Northern Virginia. We are an SNA media partner and our coverage is sponsored by Huntington Ingalls Industries, GE Marine, L3 Technologies and Leonardo DRS. 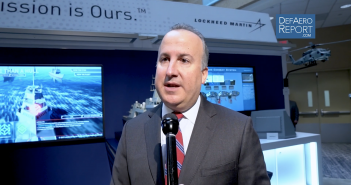 Paul Lemmo, vice president and general manager of Lockheed Martin’s Integrated Warfare Systems and Sensors, discusses the company’s proposals for the US Navy’s FFG(X) competition for a new frigate, the Littoral Combat Ship and the firm’s naval portfolio with Defense & Aerospace Report Editor Vago Muradian at the Surface Navy Association’s 2019 conference and tradeshow in Norther Virginia. We are an SNA media partner and our coverage was sponsored by Huntington Ingalls Industries, GE Marine, L3 Technologies and Leonardo DRS. Capt. 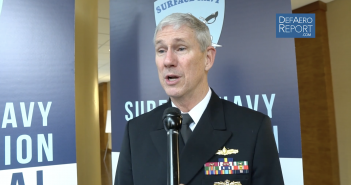 Chris Barnes, USN, the deputy commander of the Naval Surface Mine Warfighting Development Command, discusses accomplishments, priorities and training with Defense & Aerospace Report Editor Vago Muradian at the Surface Navy Association’s 2019 conference and tradeshow in Northern Virginia. We are an SNA media partner and our coverage is sponsored by Huntington Ingalls Industries, GE Marine, L3 Technologies and Leonardo DRS. Capt. 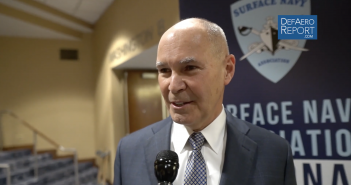 Bill Toti, USN Ret., president of L3 Technologies Maritime Sensor Systems, discusses the company’s portfolio of systems for the US Navy with Defense & Aerospace Report Editor Vago Muradian at the Surface Navy Association’s conference and tradeshow in Northern Virginia. We are an SNA media partner and our coverage is sponsored by Huntington Ingalls Industries, GE Marine, L3 Technologies and Leonardo DRS. 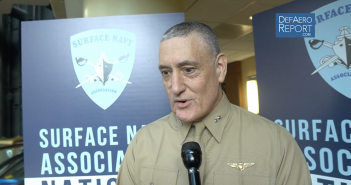 Vice Adm. Rick Hunt, USN Ret., a former commander of US Surface Forces who is he new president of the Surface Navy Association, discusses themes and issues covered during the organization’s 2019 conference and tradeshow in Northern Virginia with Defense & Aerospace Report Editor Vago Muradian. We are an official SNA media partner and our coverage was sponsored by Huntington Ingalls Industries, GE Marine, L3 Technologies and Leonardo DRS. 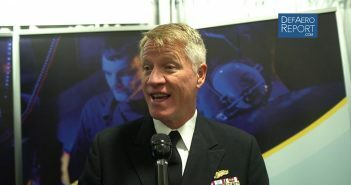 Maj. Gen. David “Stretch” Coffman, USMC, the US Navy’s director of expeditionary warfare (N95), discusses new expeditionary warfighting concepts, the recent deployment of Littoral Combat Group 1 — composed of USS Wayne E Meyer (DDG-108) and USS Somerset (LPD-25) — to South America, new formations to replace the current Amphibious Ready Group and Marine Expeditionary Unit, unmanned ships, the performance of the F-35B Lightning II and more with Defense & Aerospace Report Editor Vago Muradian. 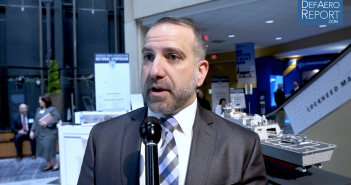 Defense & Aerospace Report Editor Vago Muradian at the Surface Navy Association’s 2019 conference and tradeshow in Northern Virginia. 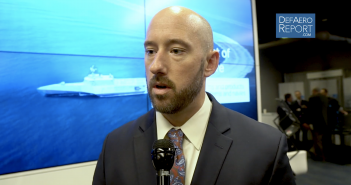 We are an SNA media partner for the event and our coverage is sponsored by Huntington Ingalls Industries, GE Marine, L3 Technologies and Leonardo DRS. Vice Adm. Tom Moore, USN, the commander of the Naval Sea Systems Command, discusses US Navy efforts to increase public and private ship repair capabilities, lessons learned from repairing USS John S. McCain and Fitzgerald, the new Ford-class aircraft carrier, getting the Littoral Combat Ship on regular deployments and more with Defense & Aerospace Report Editor Vago Muradian at the Surface Navy Association annual conference and tradeshow in Northern Virginia. Defense & Aerospace Report Editor Vago Muradian at the Surface Navy Association’s annual conference and tradeshow in Northern Virginia. We are an SNA media partner for the event and our coverage is sponsored by Huntington Ingalls Industries, GE Marine, L3 Technologies and Leonardo DRS.